What do we have here? 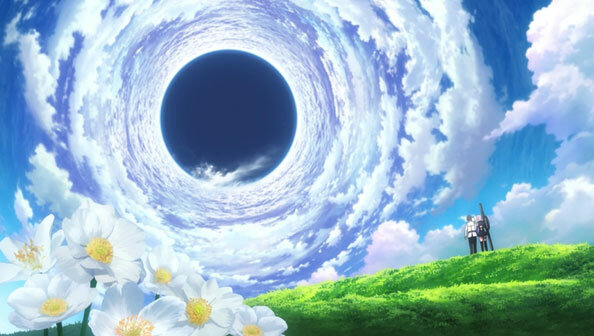 A Fate/stay night spin-off involving a time-travelling, future-saving organization. 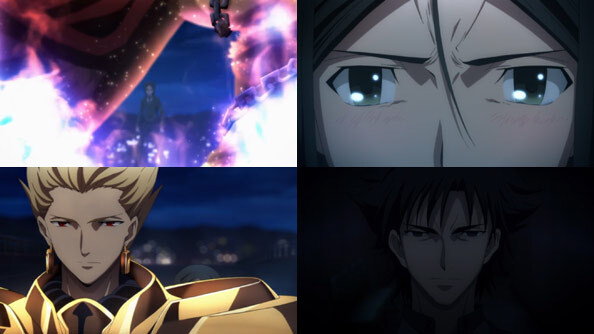 The first fifteen minutes are full of interminably dull introductions and info-dumping, including those of the supposed two leads, Fujimaru and Mash, who are also dull. 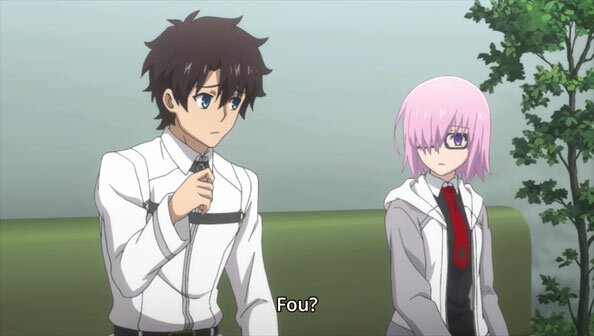 There’s also Fou, a weird white squirrel thingy that wears clothes, makes awful high-pitched sounds, and generally doesn’t need to exist, and Director Olga Aminusphere, who aside from having an obnoxious name, seems like a low-rent Tousaka Rin. 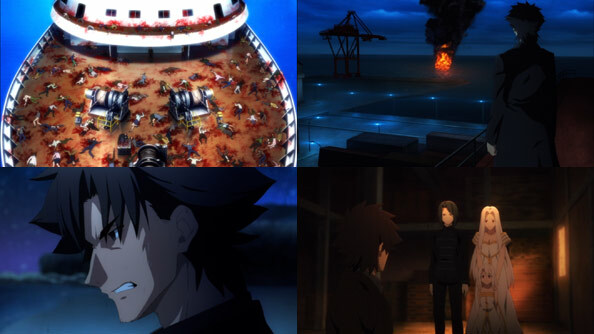 First Order essentially blows up that dull beginning by putting Fujimaru and Mash in an emergency situation that has them travelling back to 2004 where the outcome of a standard Fate-style Holy Grail War has ended up suspended for some reason. 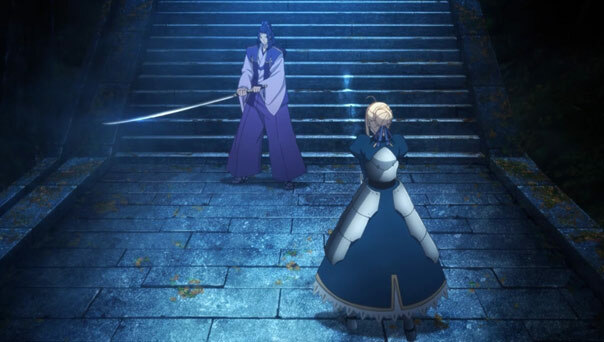 Mash becomes a demi-servant prior to dying, with the inexperienced “commoner” Fujimaru becoming her master, to the chagrin of the aristocratic Olga. 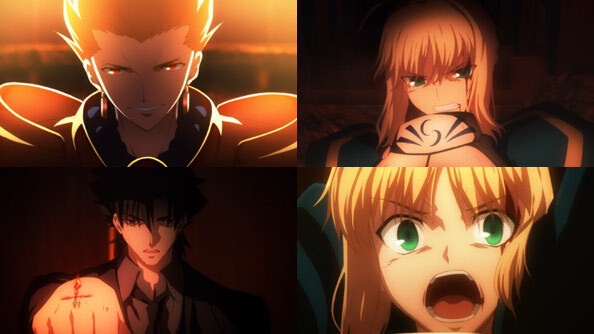 The two dull protagonists must, with the limited help of Olga and a lot of help from a particularly helpful (and badass) Caster, take out the remaining “dark” versions of Archer and Saber, in order to end the Holy Grail War and correct the singularity that is dooming humanity’s future. If that sounds a bit vague, it is. And while there’s a bit of a thrill seeing the heroic spirits back in action, albeit on different sides, it’s all a bit bloodless. No, not literally; there’s plenty of blood, but the dead, empty city isn’t the most exciting stage for otherwise cool-looking battles. 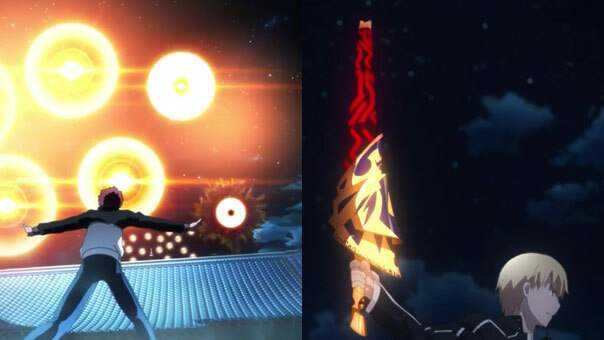 Mash’s transformation into demi-servant may have been a sign of her inner courage and toughness, and her new dominatrixy outfit is pretty boss, but neither she nor Fujimaru manage to ever make me care all that much about them or their sudden newfound friendship, as they’re less actual characters and more combinations of character traits. Takahashi Rie and Shimazaki Nobunaga try their best, but simply don’t have enough to work with here. 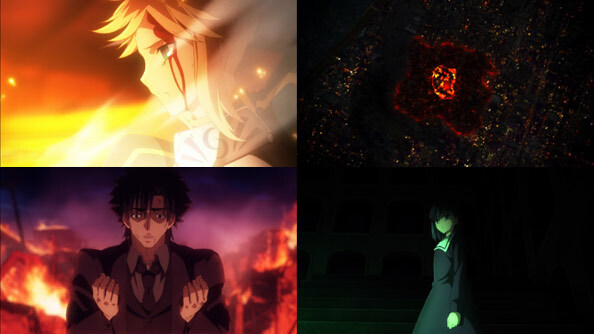 And aside from a few nice images and some competent action, the most striking thing about this Fate spin-off is its lack of the same distinct visual sumptuousness of Unlimited Blade Works (to date the only other Fate property I’ve watched), due to this not being a ufotable series, and clearly having a smaller budget to work with. Placing the fate of humanity’s future on the shoulders of two barely-there, uninspiring characters we barely got to know in over an hour-long special just doesn’t provide the gravity or stakes it should. As we’re between seasons, I had time to check this out, so I did. And it was…okay. 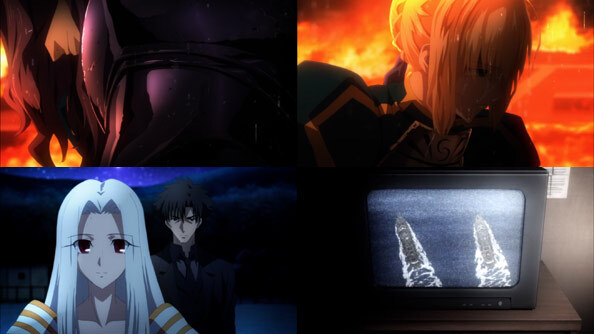 In all, it feels like a superfluous wade into the shallow end of the Fate franchise pool, rather than a deep or meaningful dive. 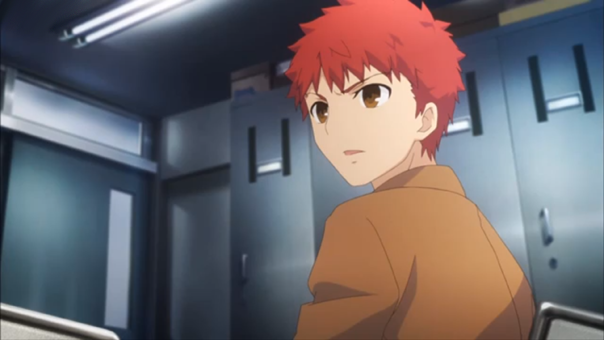 Fate/stay night: UBW episode 6 follows last week’s trend of Emiya making poor decisions, introduces another servant and, in the least surprising surprise of all, reveals Shinji is the third Mage at school. 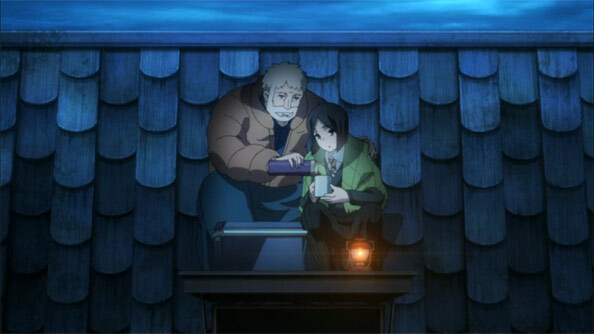 Through all of it, episode 6 had a distinct slice-of-life vibe, which was a good thing. 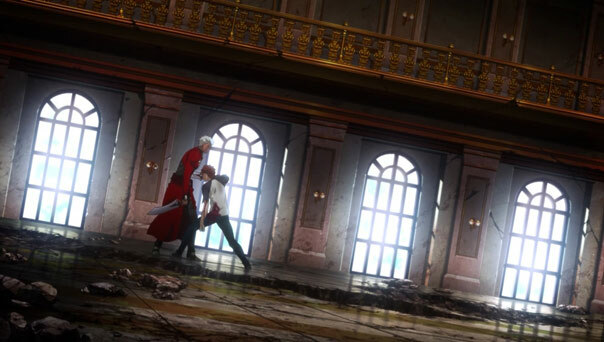 Archer’s flamboyant red costume aside, the casual way people have to talk to Emiya and the matter-of-fact way he responds to all information, went a long way to make the exposition and infodumping feel grounded. 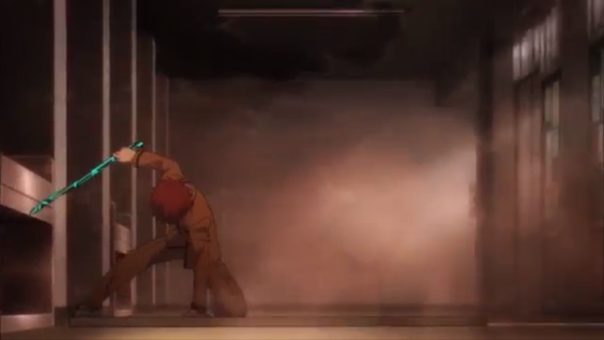 After seven episodes, my biggest disappointment with F/sn is its choice to make Emiya the protagonist, instead of Rin. 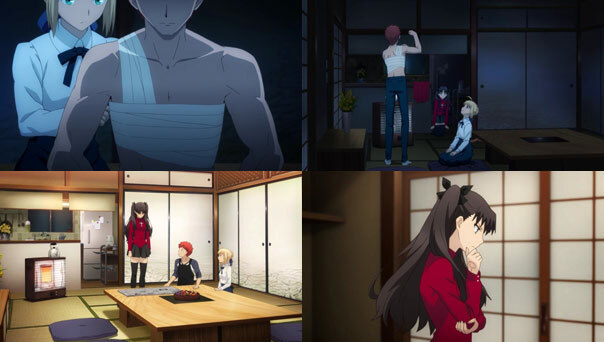 Rin certainly presents other storytelling challenges, being a hot tempered know-it-all, but I get the sense that whatever she is up to when Emiya can’t see her, is probably a more interesting story to see. 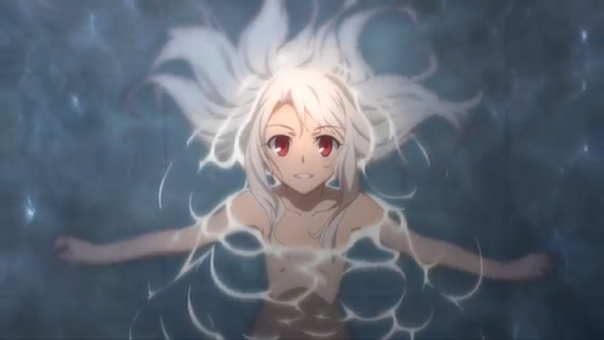 Perhaps I’m most frustrated because Emiya’s surprise does not often match my surprise? 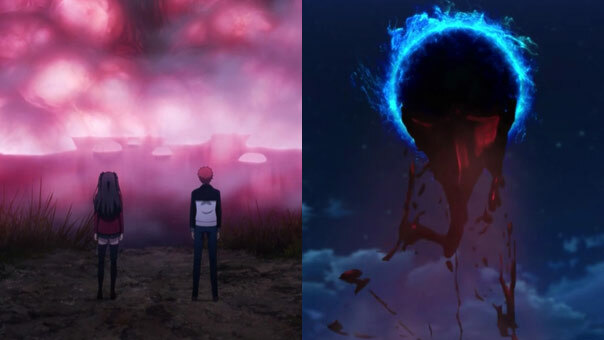 Likewise, Emiya’s total lack of introspection, narration, planning or strategy of any kind makes me wonder what Rin is up to and leads my eye to probe the backgrounds for what he must be missing. If this is intentional, it’s annoying but a clever trick. 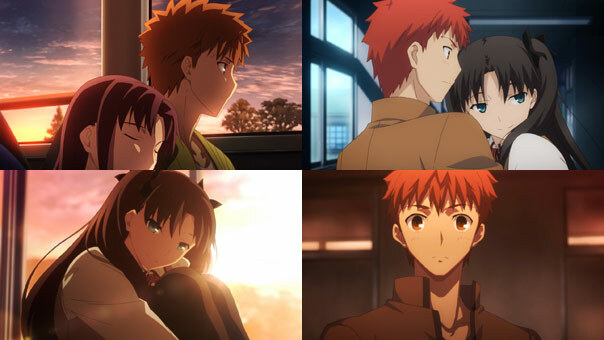 Think of it this way: because we occasionally see Rin planning and up to interesting things, and because we see her Servant Archer around more than her, we must assume, as viewers, that Archer is an intentional distraction and that Rin is up to something very interesting, without the writers and animators having to spend effort on showing us. 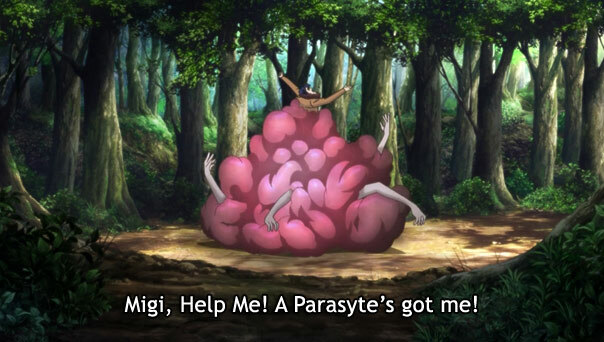 Why do I describe this episode as feeling like a slice-of-life? 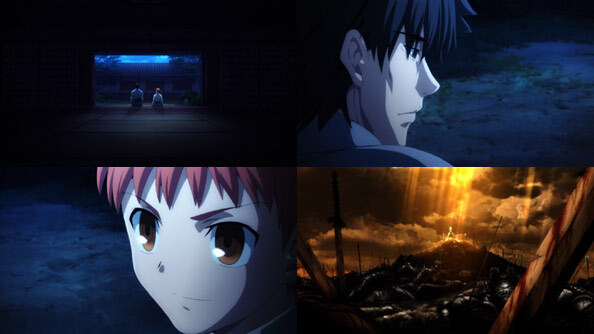 The episode starts with Archer and Emiya talking on the street as they walk home from school. 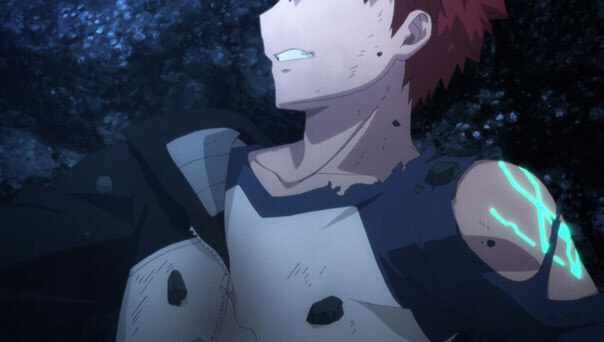 Sure, Emiya’s arm is covered in blood and they are talking about magic, but there’s nothing magical about the conversation or setting. 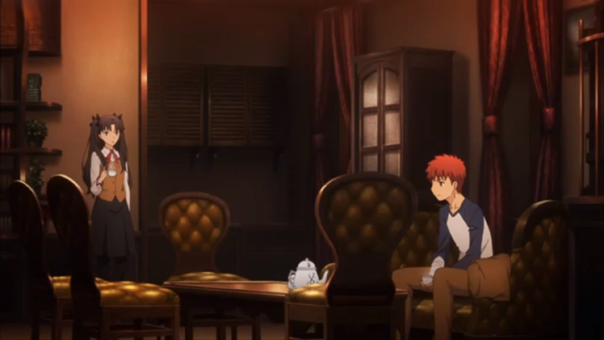 Emiya even has his school bag, casually in hand. 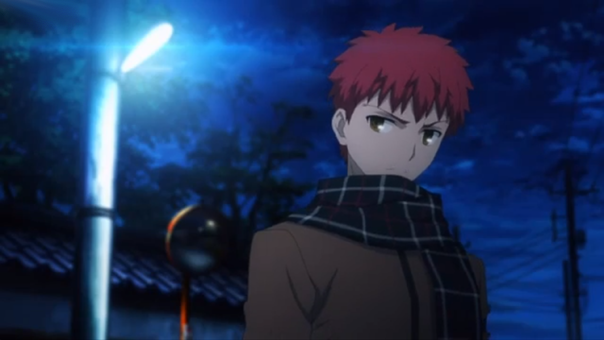 If they weren’t talking about servants, it could just be two dudes beefing about school on the way home. 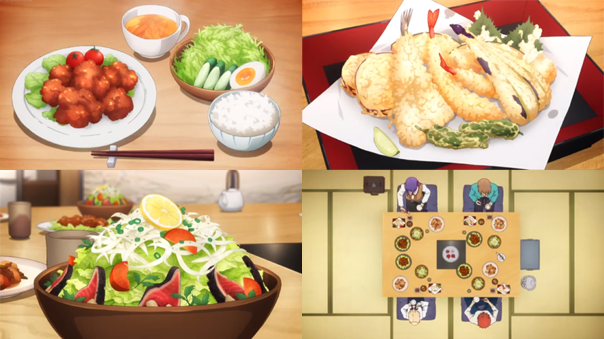 Emiya’s following day at school plays out the same way. 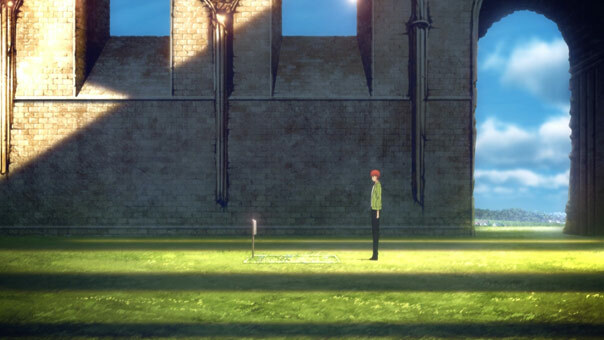 Ignoring the magical implications of his confrontation with Shinji and the Sigil removal with Rin, we really just watched a guy walk around a school building with a girl and accuse another guy of beating up another student. Heck, he accuses Shinji of something every other day and that ‘Emiya Casual Swagger’ makes it feel like any other day. This is where the lack of Rin’s point of view makes Emiya seem more stupid than he probably is. 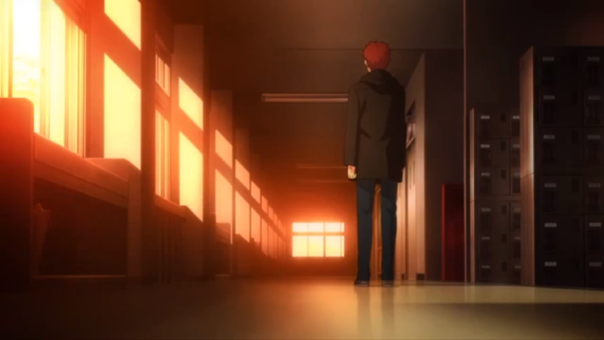 From his perspective, Rin just pops in and out of his life and appears to skulk around the school, largely unnoticed. However, for all we know, Rin goes to class in the same casual way. Perhaps more understated than Emiya does, as I doubt she’s accusing suspicious classmates in public. We just don’t know. 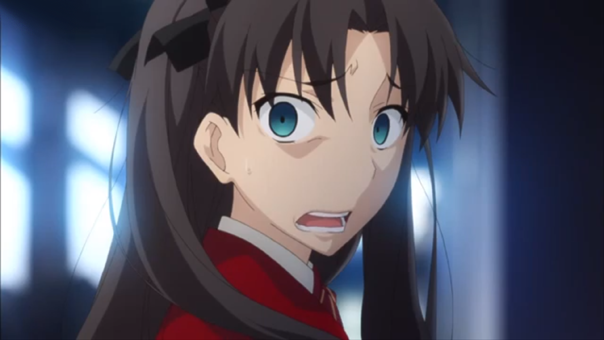 If we saw Rin in class, laughing it off with her friends and seeing her day-to-day, Emiya wouldn’t seem so clueless. It’s an interesting choice to not show that, and I’m curious to know what advantages the story will carve out by making its protagonist look stupid — with structure no less. 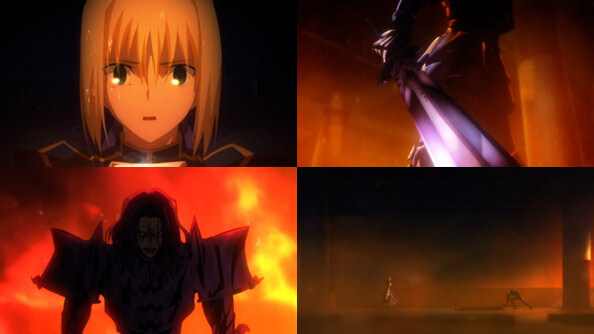 In one scene, Saber tries to make Emiya understand that as soon as they deal with the third master at the school that his alliance with Rin will end. 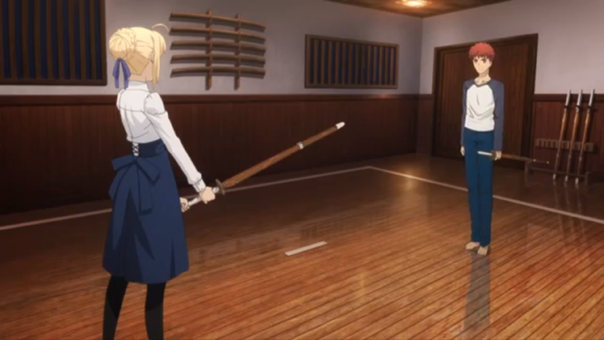 Then Saber agrees to train Emiya in swordfighting and we see how much everyone is putting into his survival and how ineffective all of it is. 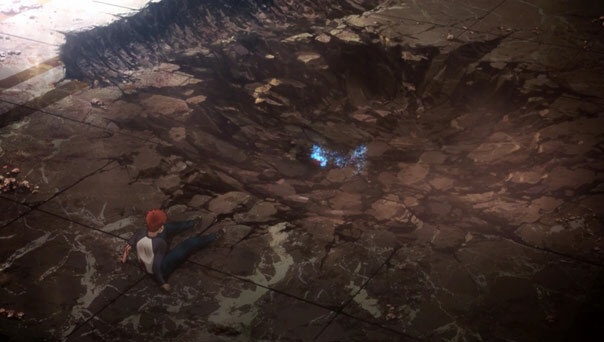 Emiya is crushed by her blows almost immediately and only resents her for it afterwards. Likewise, while Emiya claims otherwise, it’s clear that the temporary nature of his alliance went in one ear and out the other. 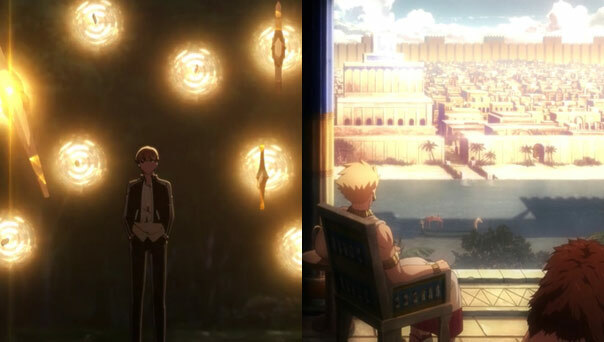 However, this scene is quickly followed by a delightfully opposite one where Emiya is working on his magic and Saber comes to watch him. The mirroring of the scenes is obvious but thought provoking. 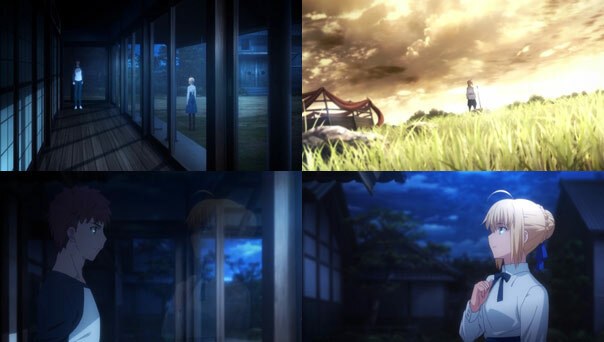 Where Saber’s scene is warm and bright, his is cold and dark. Where hers has them stand far apart, his has them crouched close together. Where hers is quick, wordless, and fierce, his is instructive and patient. 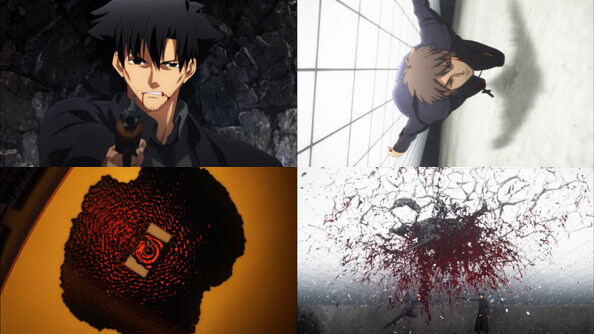 I don’t know the writer’s intention — if Emiya’s world is more personal and small and Saber’s is more violent and to the point — but it was interesting to see that comparison. Overall, this week was thoughtful and well-constructed. 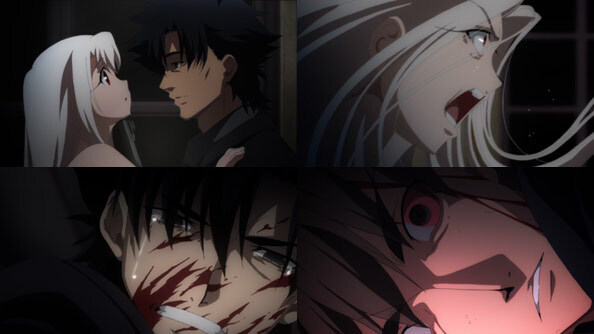 We learned that Archer has no desire for the Grail, that Shinji is not only a monster but a mage, that Caster has an alliance with Assassin and that the Servant I thought was Assassin was most likely Thief. We learned a lot and none of it felt like an instructor yelling facts at us. Coupled with my salivating need to see what happens next week, even if it’s only jaw-snapping action, that smacks of something great. Thoughts? Counterpoints? Hit me up in the comments below! 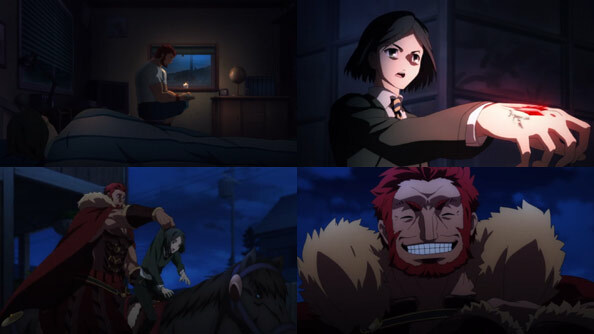 Fate/stay night: UBW episode 05 has all the pieces of a fantastic thirty minutes of anime, but never quite comes together as a fantastic piece of anime. Ultimately, it falls down because all these pieces, as understandable and dare-I-say believable as they are, do not fit together. At any given moment, the story lurches from breath-taking action, to relationship dialog, to Scooby-Doo style mystery. 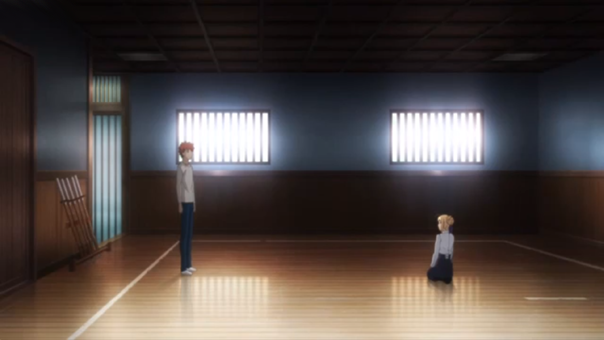 Emiya starts off his day by ignoring Sabre’s recommendation and going to school. Alone. 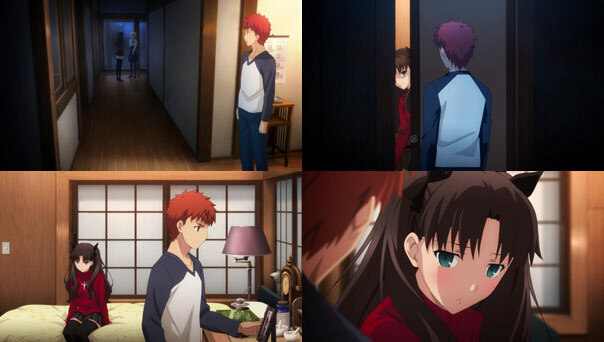 Then he runs into Rin, who is completely besides herself at how stupid he is, and how he’s totally ignored her warning that she would kill him next time too. Thank goodness he doesn’t whine when Rin tries to kill him later. 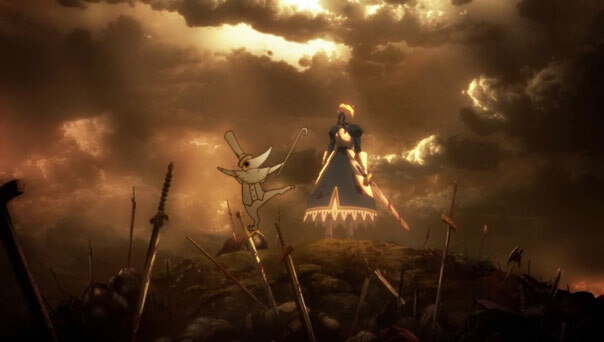 In some ways, I could see Emiya as a proxy for the viewer. (at least, young male viewers) He’s bold, knows enough to follow along, and isn’t totally useless . He’s like any starting JRPG character and we’re right there with him. 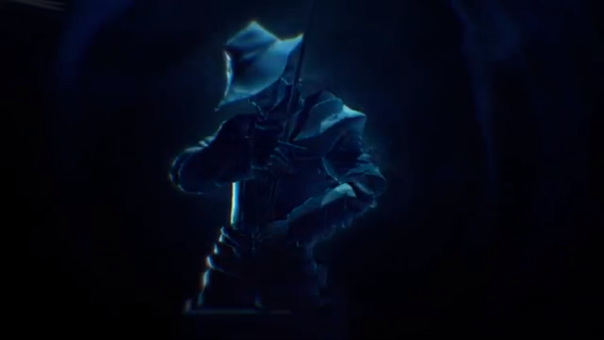 So, naturally, if he were our RPG character, we’d probably throw him stupidly into every fight and expect the level balance to make it beatable too. 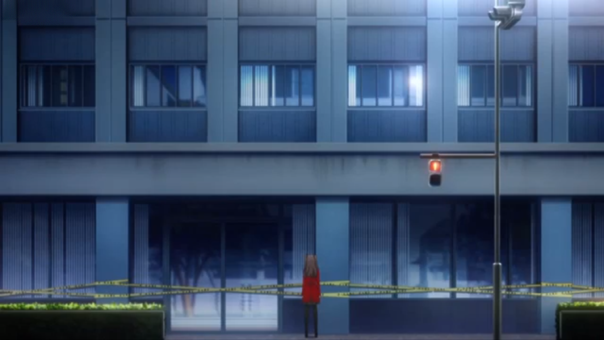 However, this is an anime and we have to watch Emiya ignore everyone and rush in stupidly. We don’t have any control to make the decision for his character, and there’s clearly no level balance to save his skin, which makes his decisions feel all the stupider. Honestly, who here isn’t wondering why he isn’t trying to learn more magic, grind up some n00bs for XP, or locate a secret magic weapon? \I’d never invite this thick head on a raid and that’s the truth! 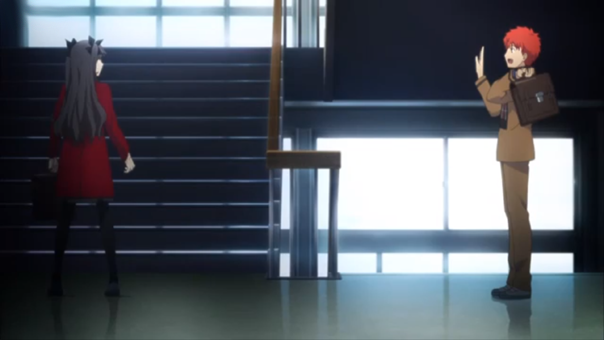 So naturally, Emiya decides to put on his investigation hat and look around the school after everyone has gone home. You know, completely ignoring the fact that mages don’t fight in public because PEOPLE are around. SMERT! 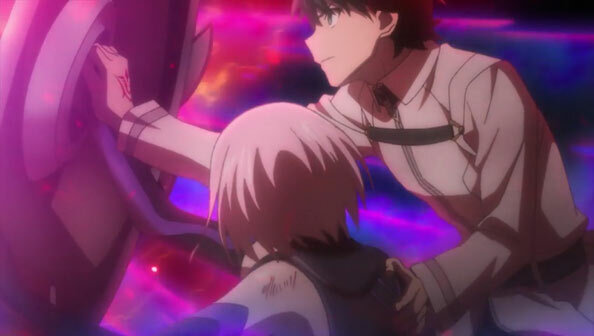 Then Rin tries to kill him or, more likely, beat sense into him over how stupid he’s being OR, since he’s already been warned, remove his command seals so that she can have control of Saber or, just because he’s incredibly annoying. 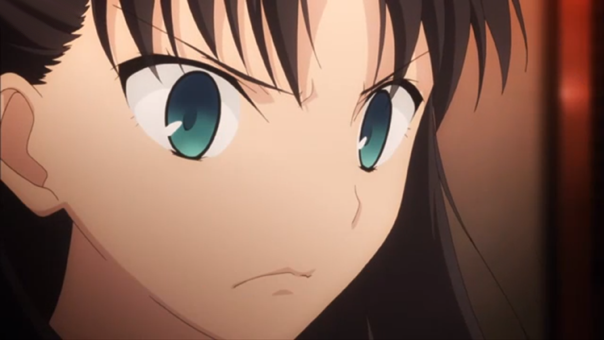 Rin’s conflict (that she likes Emiya or feels responsible for him) is obvious and accounts for why she doesn’t put all her effort into actually killing him but I’m sure this is an area many viewers will find annoying. Very very very well animated but tsundere’ly annoying. 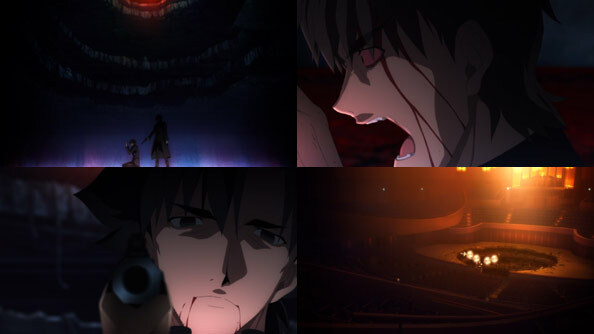 Then a girl screams, clearly being destroyed by Shinji and the fight is broken off. 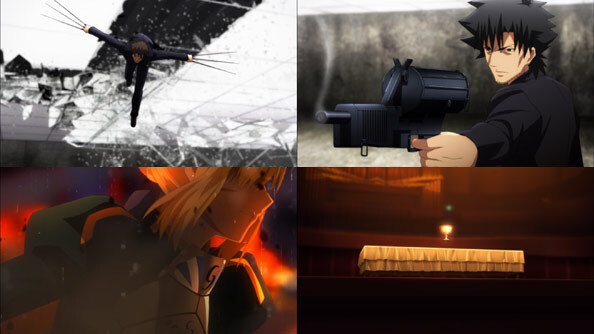 Until Emiya prevents Rin from being killed with his arm and runs off to fight against Assassin all alone. Again, showing that he’s profoundly ignorant or just plain stupid. 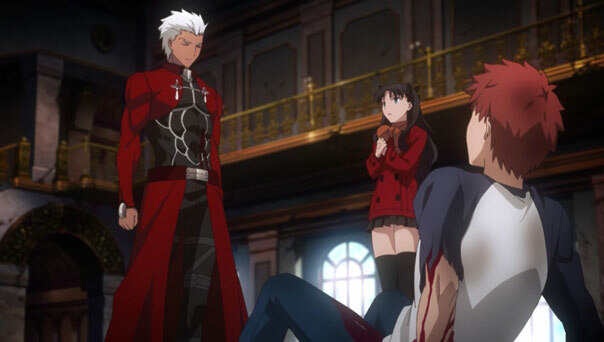 After a fight that can only be described as putting even Bahamut’s animation to shame, Rin saves Emiya AGAIN, considers herself frustratingly semi-in-his-debt AGAIN, and they go to her house to talk about. 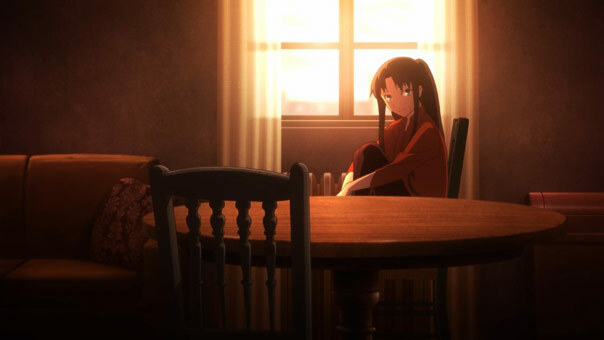 Ultimately, they talk about family and info-dump us a bit, drink tea, and form a truce that Emiya will no doubt take for granted and make Rin want to kill him again. From morning exposition to aimlessly screwing around at school, to mystery investigation, to angry relationship fight (with magic) to compassionately helping a civilian, to another magic fight, to info dump and happy relationship moments, the constant shifting of gears gave me whiplash. That said, while it didn’t hit last week’s balance of exposition with action, this week was in no way as eye-rolling as our first major info dump at the church. 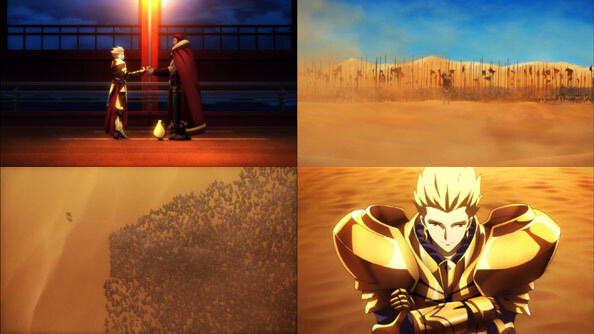 If anything, the erratic focus captures how life must feel for Emiya. However, I get the feeling that Emiya is kind of stupid and his erratic world would flow a whole lot smoother if he was smarter about living in it. 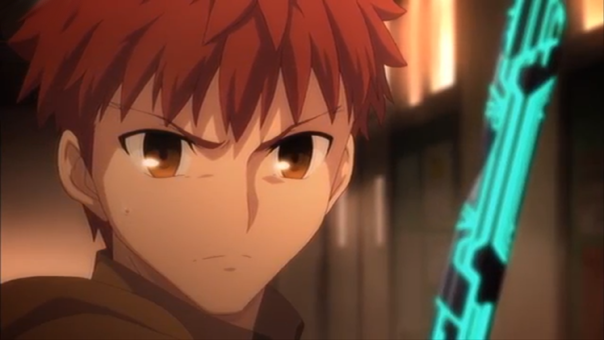 Fate/stay night: UBW episode 04 is a fantastic little sequence of exposition, interwoven through a pleasant day in the life of Emiya Shirou and bookended by the harsher realities of Rin and Einzbern. 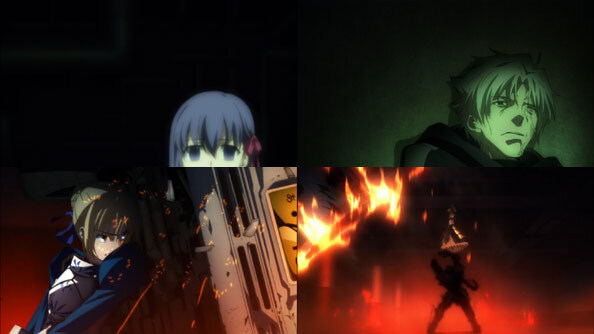 Like All F/sn, this week was beautifully rendered and calmly paced. However, the story was told with such a casual speed, and told through so many cheerful people (often walking slowly or listening to each other with a warm and obvious intent), that watching it felt like taking an evening stroll in the Fall. 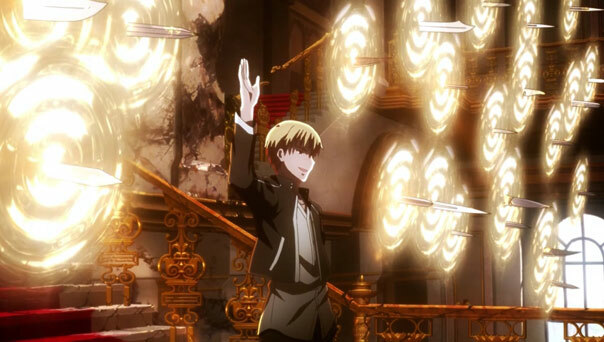 This week’s arc is all about timing and the threat of failure due to a mage tipping his or her hand. 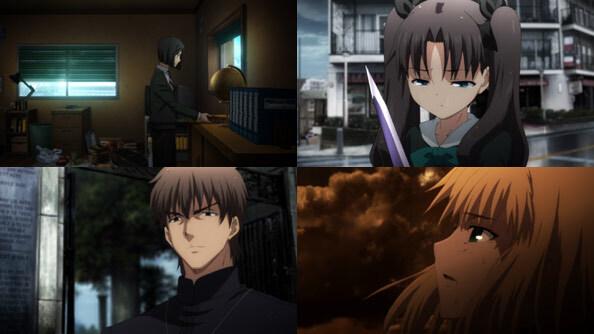 For Emiya, he must hide Saber’s identity (and truthfully, his tortured memories of hell fire) from his friends for their own safety and he must even allow Saber to hide her true identity from him, or risk being defeated by the more experienced mages who may be able to read his mind. 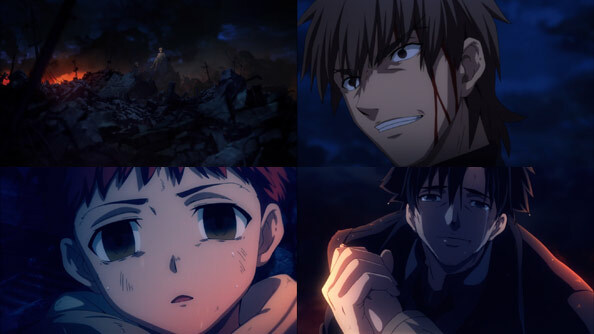 It’s a clever way to keep us guessing and in the dark, but it also shows Emiya’s trust in other people, and his trust in other people to trust him. 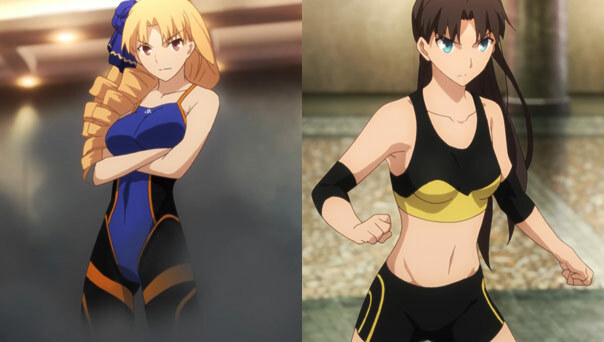 For Rin, the risk is that she’s already revealed too much in the last fight to anyone who could have seen it and that, by saving Saber for last, she risks too much by leaving taking on too strong opponents too quickly. 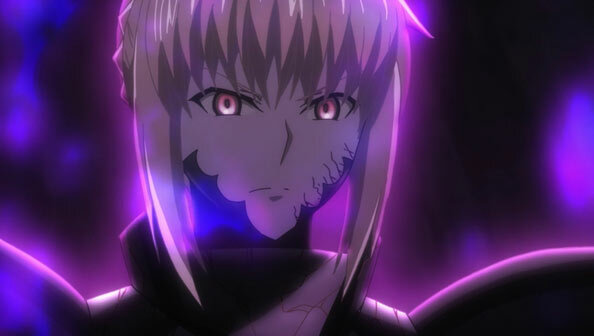 Worse, she risks having to face and kill Emiya because he’s likely not going to stay away for her. She risks tipping her hand, even to herself, that she actually likes him, which will no doubt be her undoing. 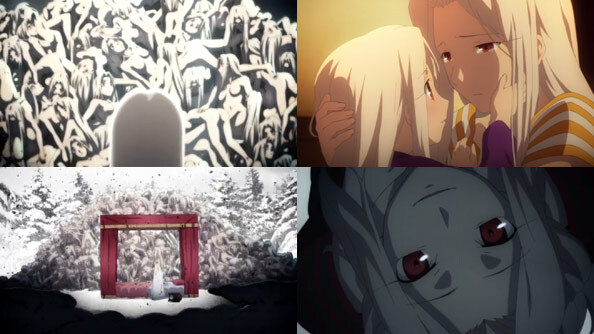 Einzbern risks the least and the most, depending on how things unfold. Her adherence to a predator’s nature — to torment her prey until it can scream no more — will most likely come back to bite her. Yes! 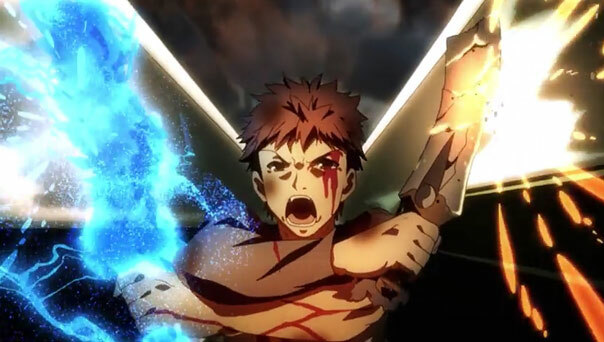 Berserker is unimaginably powerful but it’s arrogant to think he can not be defeated. Especially after revealing what his Nobel Phantasm is to her opponents. 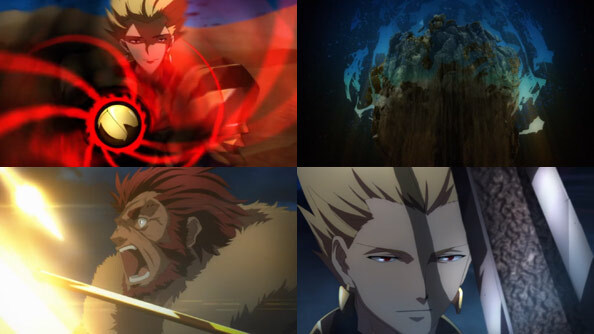 Giving them time to consider the best solution to defeating him (which Rin and Archer are most likely doing) is an obvious mistake. For her sake, she better hope his power is as unbreakable as she treats is. 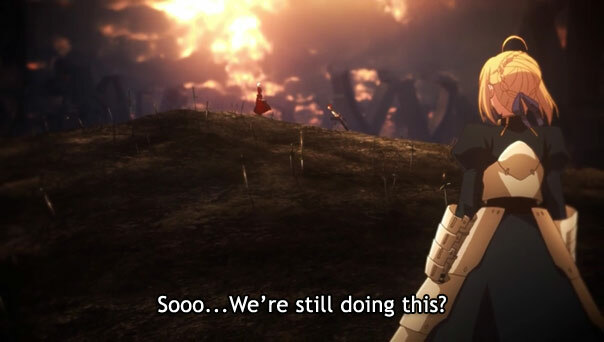 As for the actual events of episode 4? 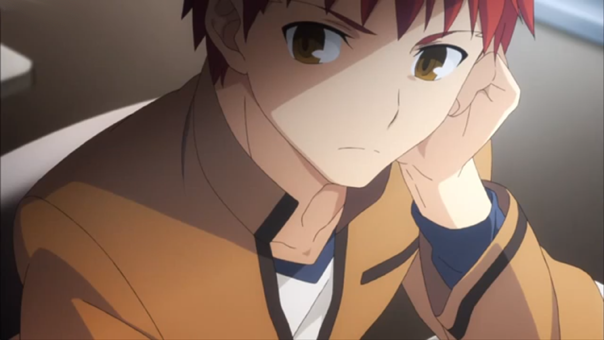 Emiya recovers from his wounds (he appears to have self-healing magic) and goes to school on an off day. Saber follows him and is a distraction for many girls who like him or worry about how rarely he truly smiles. 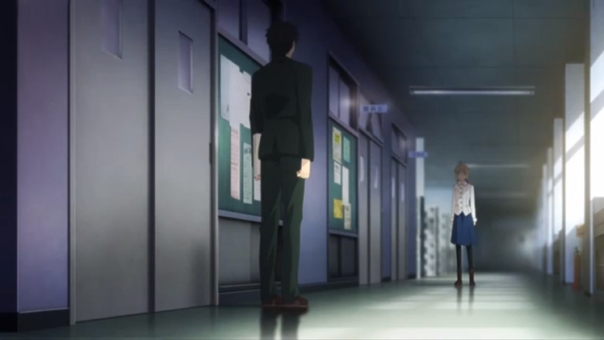 Saber explores the school and encounters a teacher who seems like dangerous news but that avenue remains unexplored, or just a red herring. 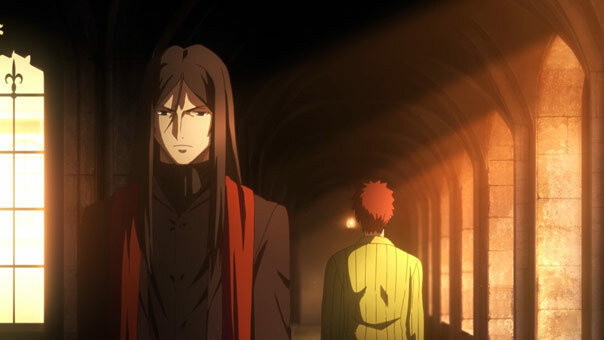 Rin investigates the ‘gas leaks’ more directly and, with Archer’s help, identifies the culprit as the Caster Class servant. They seem powerful and, given the spell seems to be a love-crushing spell, presumably female. 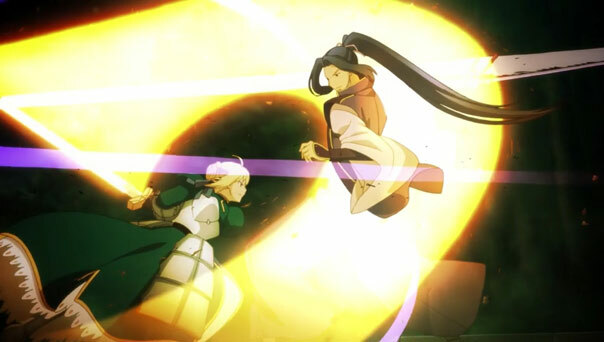 Archer is concerned by their chances of success of defeating this opponent. This scene includes a short but dramatic fight against skeleton dogs in an office building hallway. 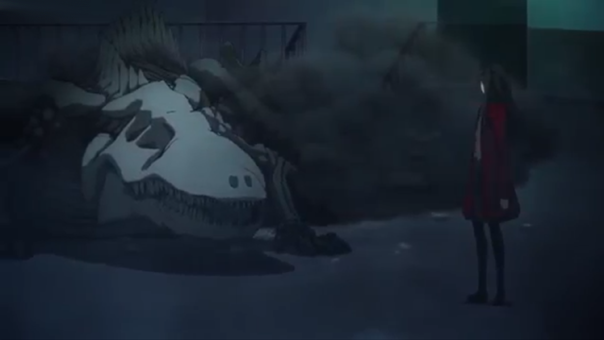 Skeletons are hard to render by any standard and F/sn does not disappoint: not even Bahamut’s recent zombie/sea monster battle looked this good! 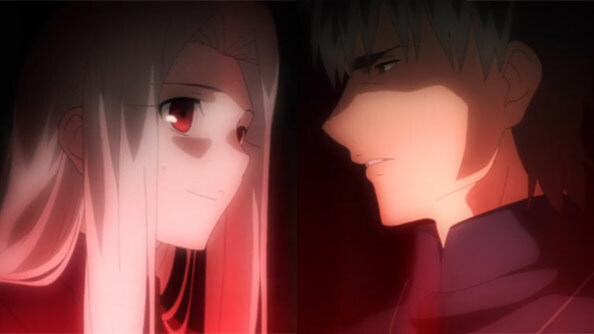 Then the women in Emiya’s life decide to move in with him — and who can blame them? 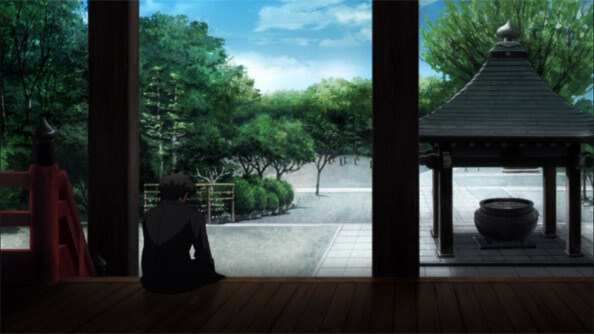 Saber’s sudden appearance, lack of spoken words and the fact that she is living with him would make any friends nervous, if not a little jealous. Fujimura-Sensei practically lives there anyway and, given how obvious Sakura’s affections for Emiya are, it’s no surprise Fujimura-Sensei helps rope her in too. 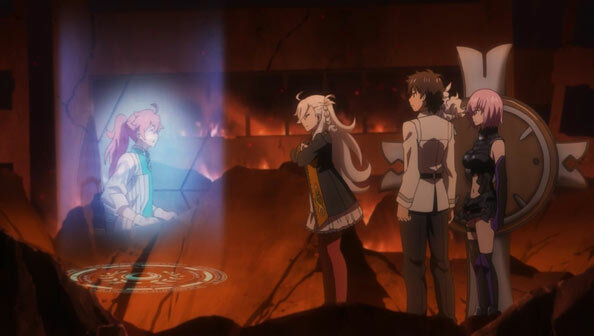 For all these happenings, ep 4 explains a lot about Servant Classes, vaguely how and why the grail summons them, and the intrinsic tactical advantages gained by knowing exactly which servant you are fighting. 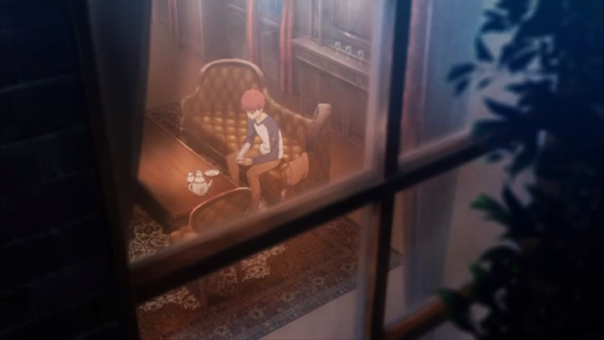 This is exposition to be sure, and delivered by Saber-monologging, but it’s all lovingly rendered in ghostly CGI — which is implied to be inside of Saber’s tea cup. 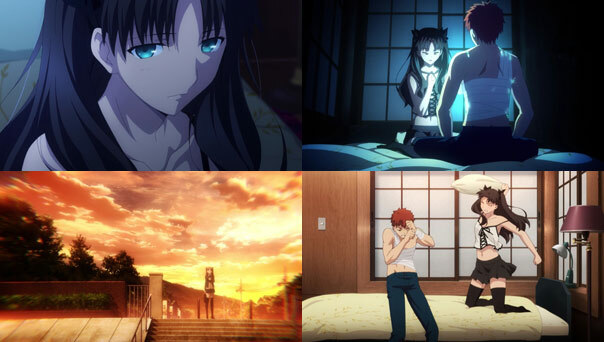 The implication is that she is imagining these roles and we (and Emiya) are getting to see. It’s rather clever and very effective at making the info dump engaging and grounded within the scene. If etherial imagery can be grounded? What’s left to say? 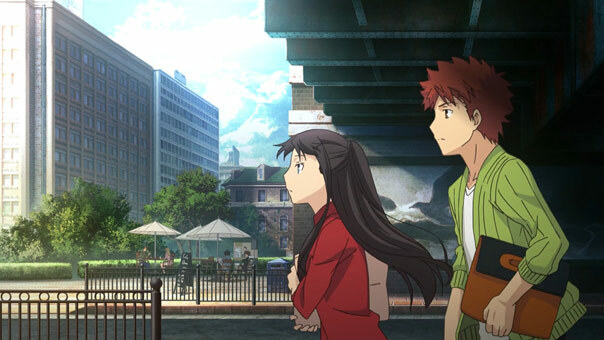 F/sn’s slowness — its deliberate nature — is artful in a way that transcends what is already visually beautiful to become something totally beautiful. 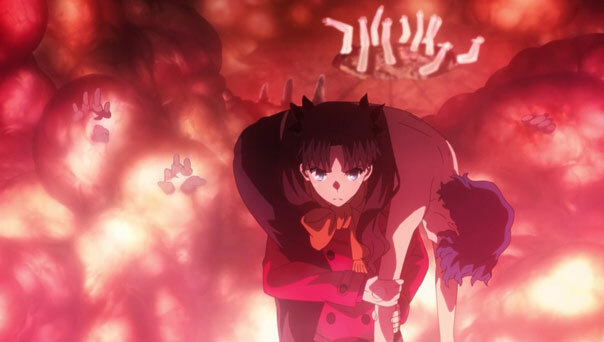 In short, F/sn is masterfully constructed Art, in all senses and disciplinary applications of that word.